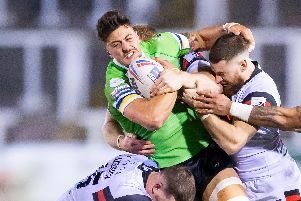 THE game between the Kingstone Press Championship’s League Leaders and a team that’s already relegated went exactly to script as Leigh ran in 11 tries against their ground-sharing neighbours Swinton. Centurions cut loose in the second half having been a little sluggish early on. All the backline scored at least one try while Martyn Ridyard kicked nine goals on his way to a personal points tally of 22. But some of the shine was taken off the result by a serious injury to Leigh prop Tom Spencer. He went down in agony after being tackled and although he was able to leave the pitch without needing a stretcher, Centurions boss Paul Rowley later said Spencer had suffered an ACL injury which could require a full knee construction. If that is the case it marks the end of his season. Both these sides call the Sports Village home but naturally the Leigh fans outnumbered the Swinton contingent in a crowd of 1,342. The game had a subdued feel early on, a world away from Leigh’s last game here when they clinched the Kingstone Press Championship League Leaders Shield by beating nearest rivals Featherstone. Leigh dominated the early stages but only had a ninth minute try from Sam Barlow, converted by Ridyard, to show for their efforts. John Duffy’s side didn’t help themselves with a succession of handling errors and they found themselves further behind in the 21st minute. Ryan Brierley and Ridyard linked to give Liam Kay the chance out wide and he finished brilliantly. Ridyard couldn’t convert. Shortly after, Leigh scored their third try when a kick to the ingoal took a wicked bounce and Ridyard was able to touch down. He also added the goal to make it 16-0. Swinton enjoyed some good spells inside the Leigh half in the 10 minutes before the interval but they were thwarted by a combination of determined defence and poor handling. A move at the scrum saw Brierley send Tom Armstrong in for a try six minutes after the restart. The tries flowed at a steady pace for the remainder of the half. Debutant Michael Platt who showed some good touches broke clear before sending Brierley away to score in the 48th minute. Then Platt scored himself four minutes later, racing onto a kick ahead from Kurt Haggerty. Brierley raced from inside his own half before his well-timed pass found Gregg McNally in support to score under the posts in the 55th minute. The Leigh full-back then created a second try for Armstrong with a looping pass to the corner. McNally crossed for his second after a rapid 80 metre multi-player attack to bring up the half century with 10 minutes remaining. Centurions continued to dominate, adding tries through Anthony Bate and Adam Higson either side of Swinton’s only score from Andy Ackers. Ridyard finished with nine goals from 11 attempts.